My progress on Kutarug. Each of these pinwheel blocks finish at 2 1/2", yes the pinwheel are that tiny. 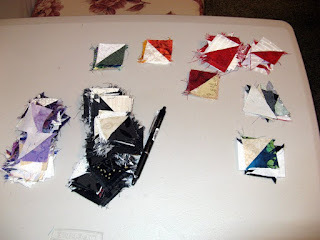 I still haven't a clue how many are needed to have this project finish to a king size quilt. I'm just continuing to make them. The difficult part for measuring is that assembly will take place vertically not horizontally. Anyone who can help me figure this out would be most appreciated. 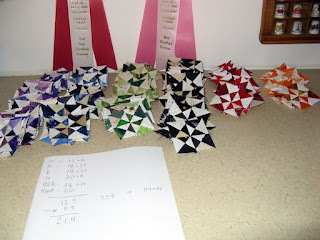 From the original pattern that used 3 1/2" pinwheels, 234 were needed. This resulted in a project that finished at 59 x 81. Guess I'll have to see if my DH can figure out the math. 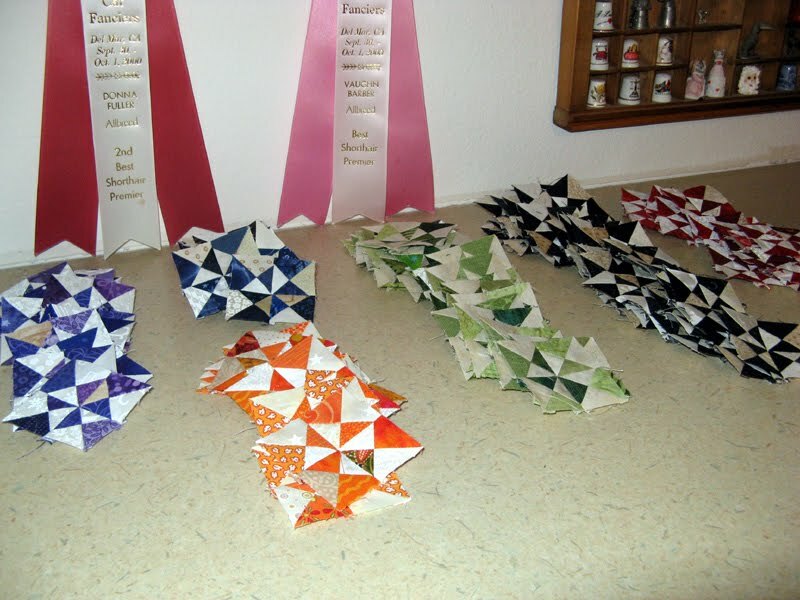 These are the 1 1/2" hour glass units that are used to create the pinwheel blocks. 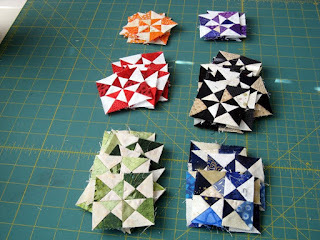 Each pinwheel block requires four of these in like colors. Here are the next batch of hour glass units in the making. 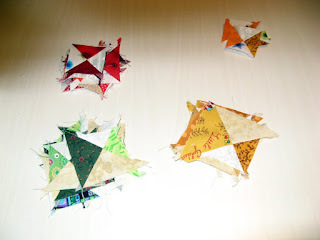 You might know the time consuming part comes into trimming these down from the bonus triangles they started from. These are what is left to add to the growing project on the design wall. 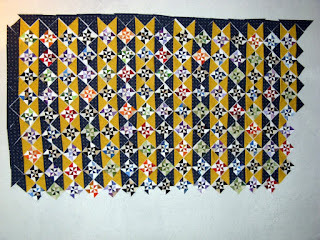 Then there's the easy blue/yellow half square triangles to make more of. I just might get this project done by the end of 2017! I'm able to count some stash used. Although these four kits aren't sewn they will be on Saturday. 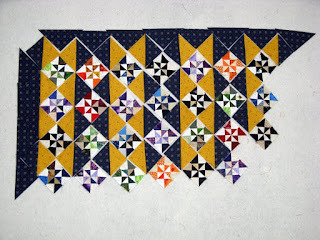 A contest to see which quilt guild can complete the largest amount of inches with charity quilts is to be held at the San Diego Quilt Show that starts on Thursday. The prize cash for the guild. Kerry will be doing this along with me and several other guild members. There are four two hour long sessions. 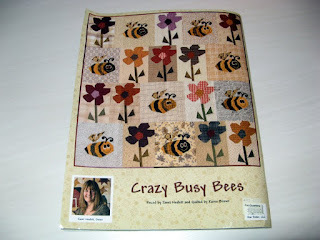 Kerry and I will be doing two of these sessions so we shall see how quick we can assemble. The design is simple 6" squares five across and six down. There are sure to be photographs taken. Wish our guild luck! I also finished the binding, sleeve, and label on the guild's opportunity quilt. If you want a chance on winning let me know. 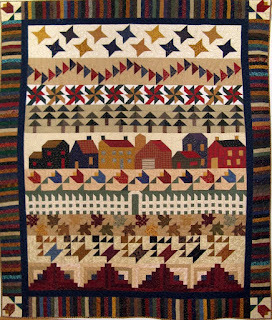 I have six quilts being displayed with three of them in the getting a "good look" by the show's committee. The other three are offered for sale. Kerry was kind enough to turn them in for me on Monday; otherwise a mad dash during lunchtime down Interstate 15 would have consumed my lunch break. The setting fabrics started turning into settings! A start on the design wall for Kutarug. These hour glass units are 2 1/2" (finishing 2"). I will leave this discussion for tomorrow's Design Wall post. This week there is an add to my stash that you can read is already being used. 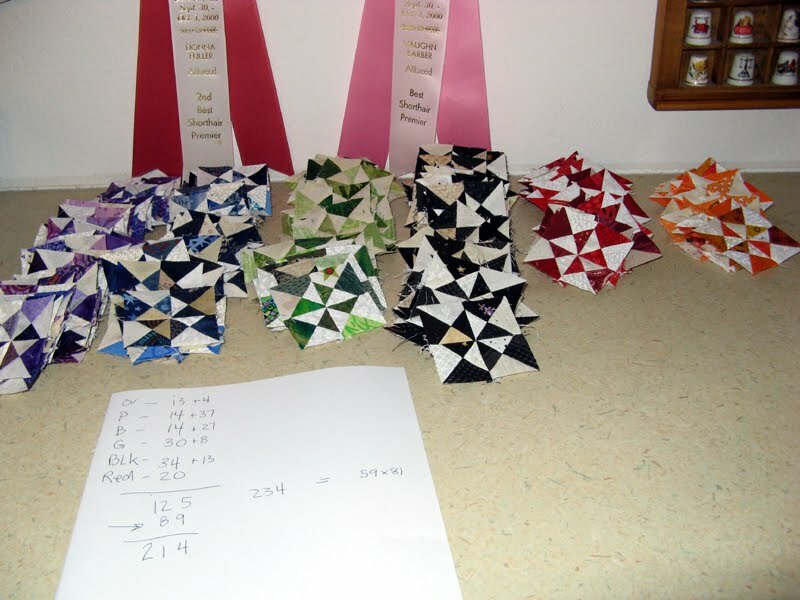 14.75 yards total from Fat Quarters in Vista, CA and Erica's in South Bend, IN. Remembering those who perished on this day 16 years ago. 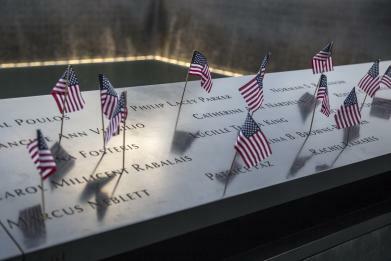 This day changed so many things that we do each and every day. Not much change in Kutarug. I'm still working on the approximately 400 (this is a guess) hour glass units that finish at 2". 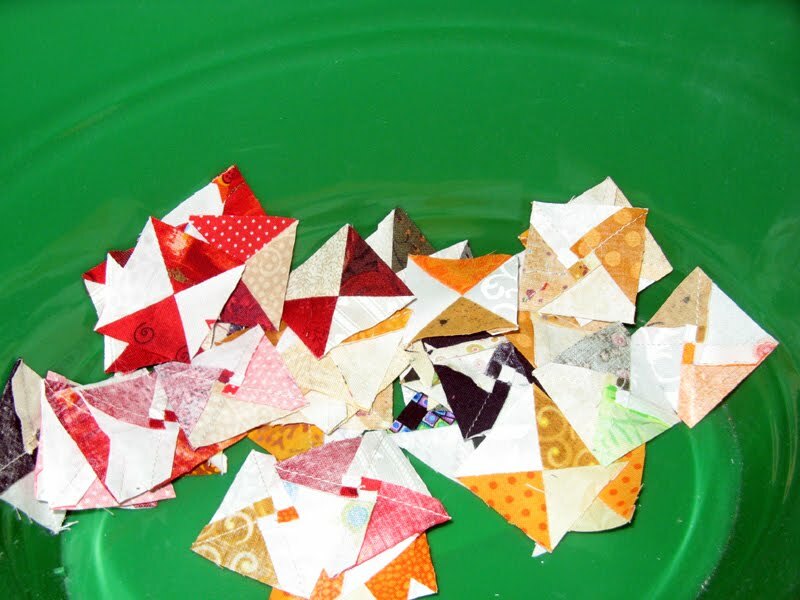 Kerry will be looking in her bonus triangle stash for reds or greens that I can use. I hope she finds a bunch! I did purchase fabric for the setting triangles today at Fat Quarters Quilt Shop in Vista. I sure like this shop. I don't get the chance to visit as much as I would like as there is a distance involved, both from work and home. It has lots of fabrics and patterns tucked within the small converted home that interest me. There is always laughter filled in the shop when there is a workshop going on. I purchased about half of what I need of the blue (Conestoga Crossing Navy Diamond). 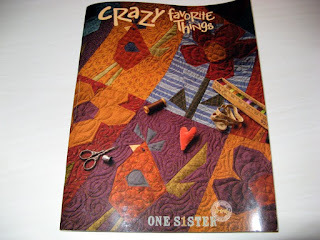 I will be online purchasing the rest from Erica's Craft and Sewing Center in South Bend, IN. 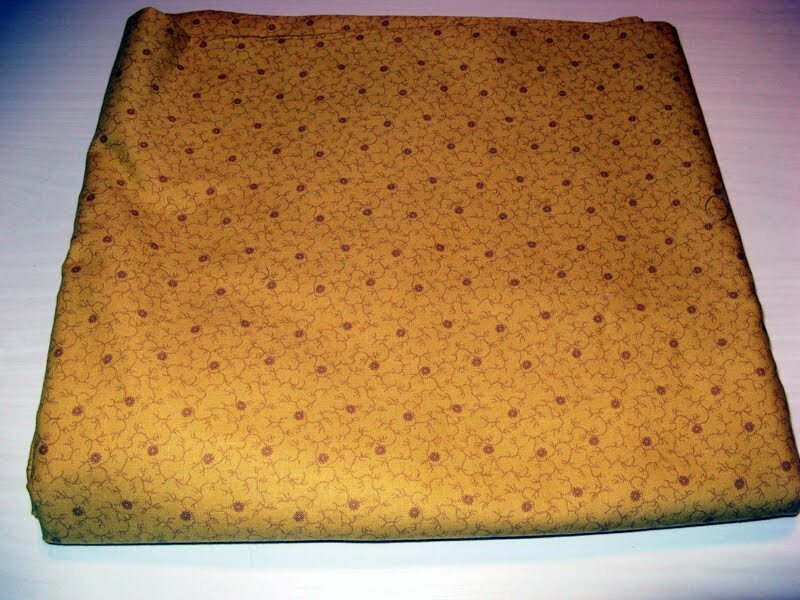 The mustard fabric at Fat Quarters Quilt Shop had all the yardage I think that will be needed. 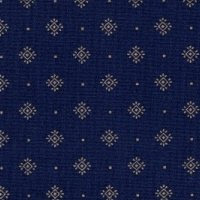 Paula Barnes for Marcus Fabrics Design 3322. I also came across One S1ster Design books! Janet Nesbitt from half of what used to be Buggy Barn has six books out now. 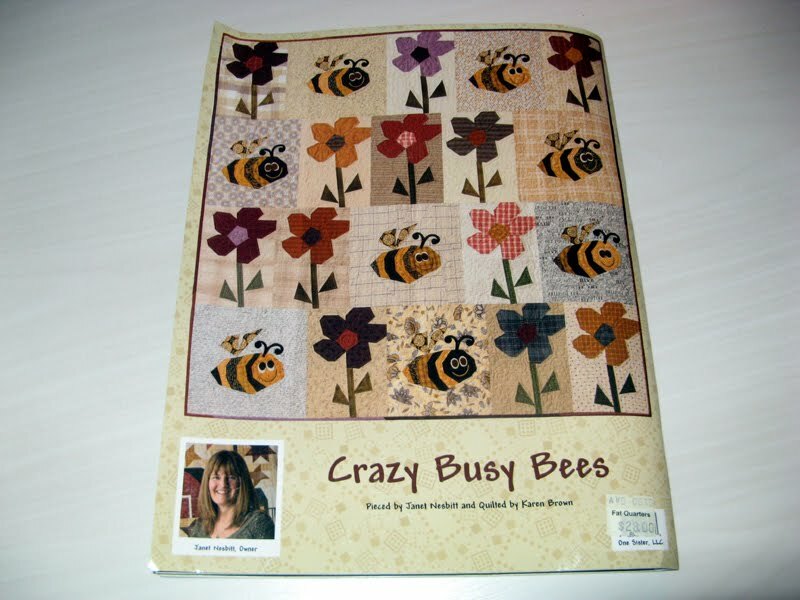 I couldn't resist for the pattern Crazy Busy Bees. I have another coming to me arriving Friday via Amazon called Completely Crazy that I'll share once I have it. 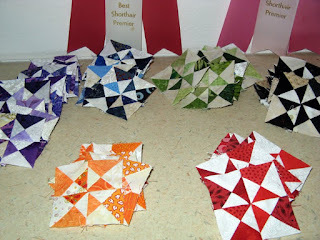 Tuesday is Sunshine Quilt Guild first meeting of the new membership year. 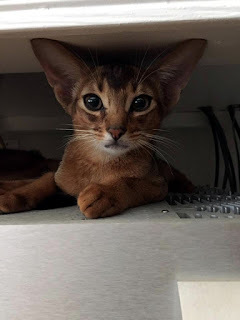 I am looking forward to seeing everyone. Today has been a pretty day in San Diego. I wish that were so for Florida. My brother and sister-in-law are in Tampa. They are staying put in their home unless an evacuation order is released. As I write Irma is just south of Tampa. 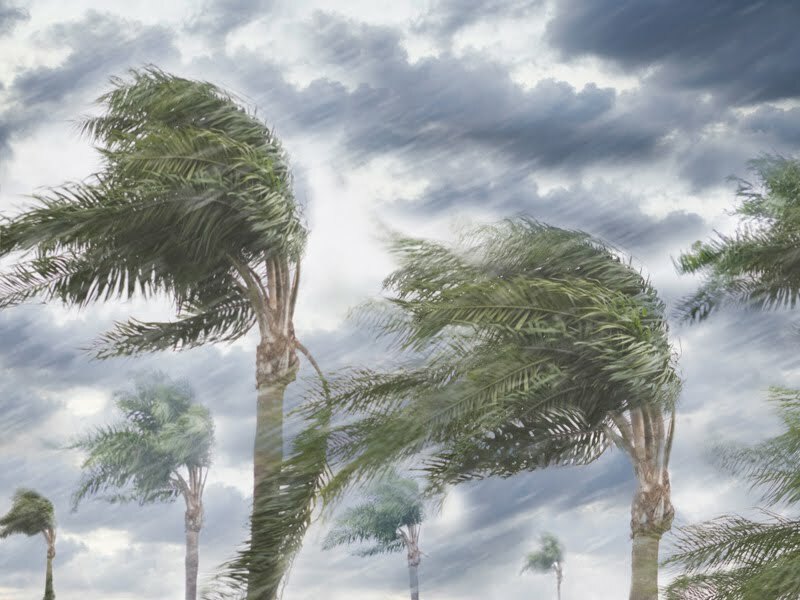 Another couple of hours of the wrath should see them clear of the Category 2 Hurricane. Don't know about any of the conditions in their home, but my brother has his wife and dog prepared for just about everything. Pine trees in the back need to stay put. It would have been far less scary if Irma chose a different time of day to move through Tampa. 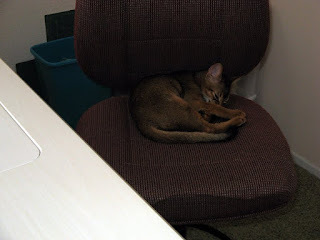 I did get in some sewing today while the kitties slept. The routine is eat, play, play, play, sleep...repeat. There are many more to sew, but the completed hour glass units are growing. You might notice that the red and orange are not that many. 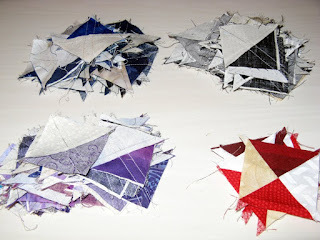 Probably need to make more of these colors as there are no bonus triangles to get me through. I still have lots of purple and black ready to use. There is a long way yet to go. 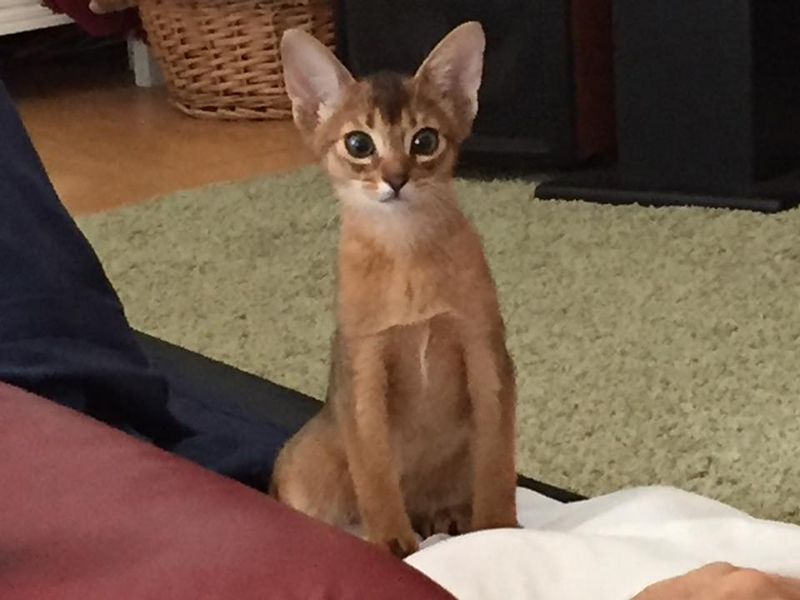 The progress is slow...spending quality time with my two new kittens. They get lost in our home pretty easy. I am up to 125 of these hour glass blocks. Very few orange and red. 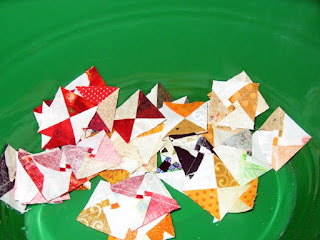 Seems there weren't too many projects that I had bonus triangles in these two colors. I have lots of the other colors to make. 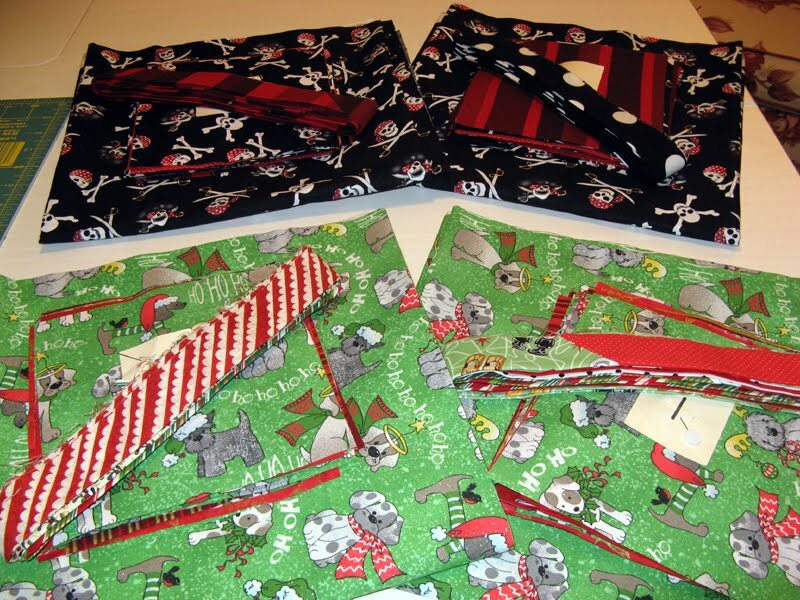 Depending on the setting triangle fabric I may make more orange and red; we shall see. I still haven't found the two main fabrics needed for Kutarug. These two have been occupying my time! 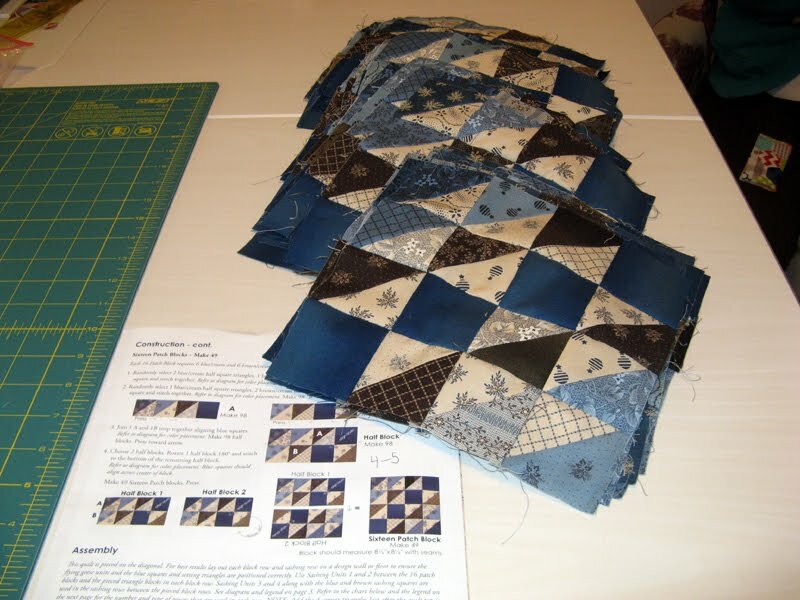 The first photo is pairing up two like colored HSTs and marking a diagonal center down one of them. Right sides together of course. 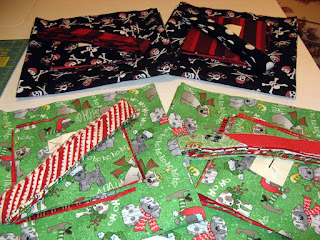 Whilst they sleep I sneak to the sewing room and sew down either side of the drawn line. 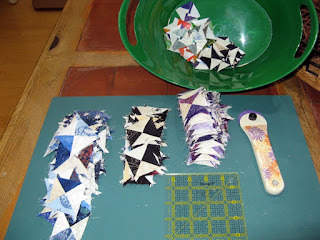 Then before they wake I am back to the using scissors to separate the two sides. Next is the finger pressing and then the most important part trimming them up to 1 1/2"...my favorite part. 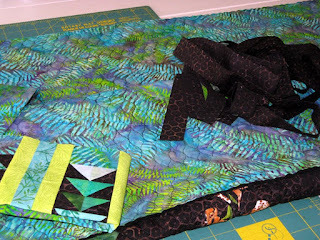 Once again no change to my fabric usage, but that will change soon as I narrow down the main fabrics of this quilt and purchase! 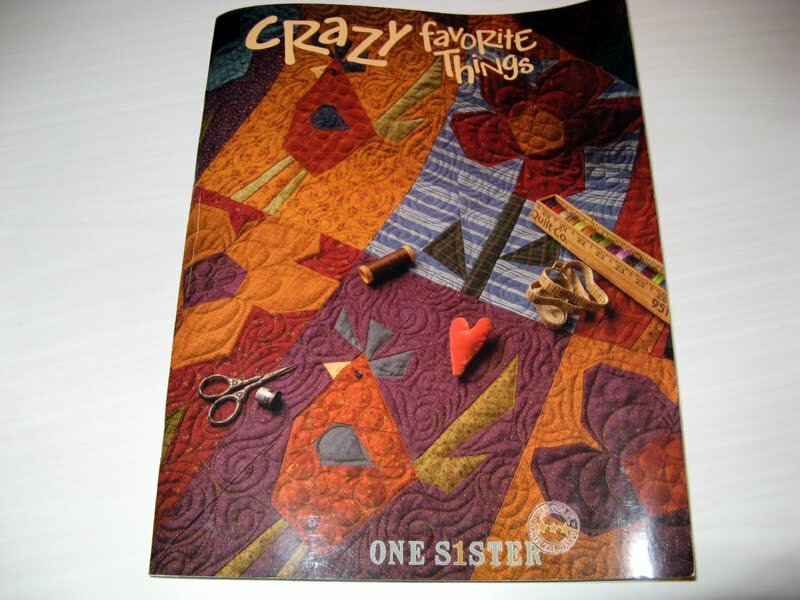 Judy of Patchwork Times randomly choose #4 UFO to work on in September. Konstitution was started with the purchase of fabrics in 2015. Kerry and I worked on three projects that we broke up into monthly sections during 2016. 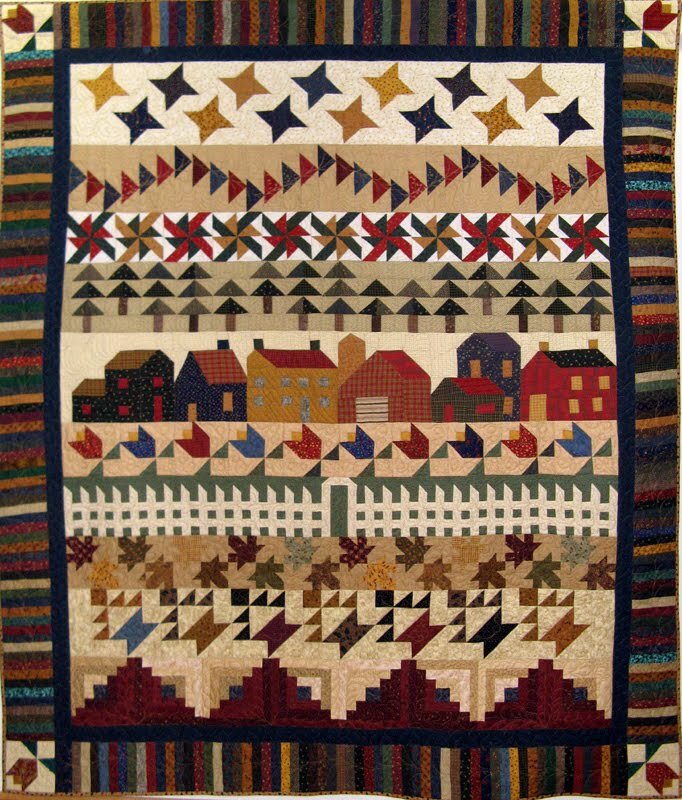 This was one of them, Union Blues by Etter Chelair. Lucky Kerry has finished all three. I got two done, but Konstitution has been collecting dust at the conclusion of Month 5. With my two new kitties arriving tomorrow we will see how far I can get with this project during the month. I still have to finish #8 UFO for August. 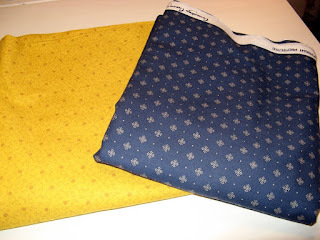 The two primary fabrics have yet to be purchased. I am however moving fairly well through the making of the hourglass blocks. 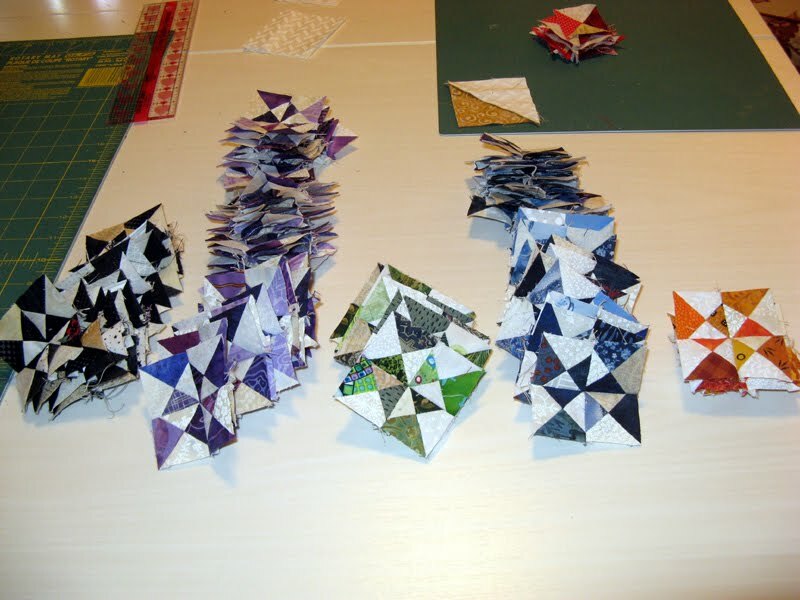 Kutarug will be using only bonus triangles in its making. Nice to reduce the once overwhelming HSTs from numerous previous projects. 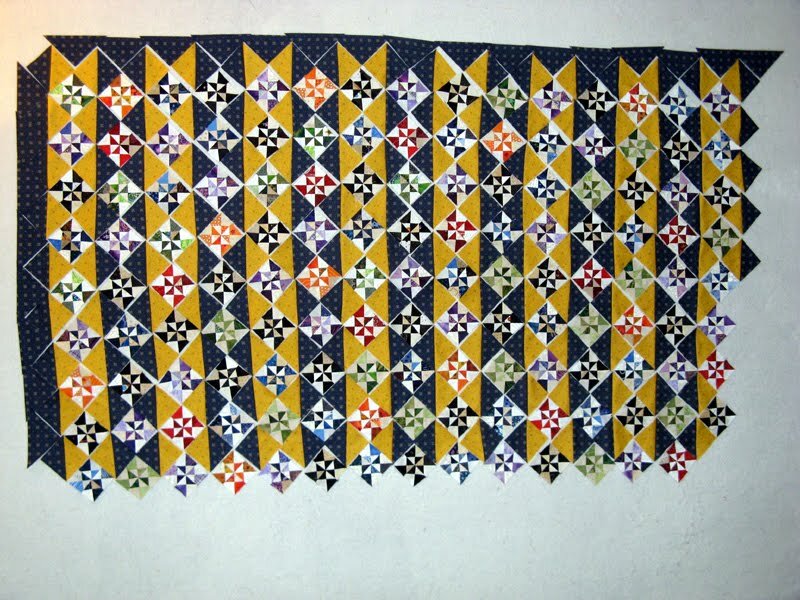 This project called Winning Combination by Tammy Vonderschmitt will be for our king sized bed.